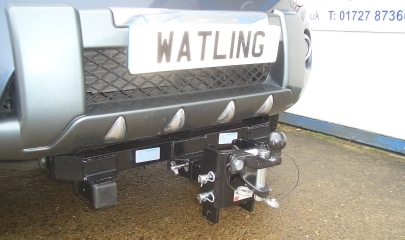 If you are looking to consistently move heavy trailers such as mobile homes or large boat trailers, or if you have other heavy duty applications in mind such as winches or even a snow plough, then a Watling heavy duty front towbar is for you. 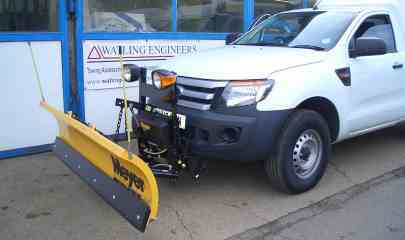 We have developed a range of applications for most common commercial vehicles, all available pick-ups and many large 4x4 vehicles so that we have an option for nealy every workhorse on the road. Our heavy duty front towbars all have a centrally mounted 2 inch receiver but in most cases, options exist for left hand and right hand receivers as well. 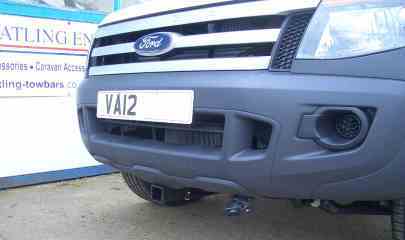 Below is an example a discrete 2 inch centre receiver on a 2012 Ford Ranger and one of the uses it can be put to. 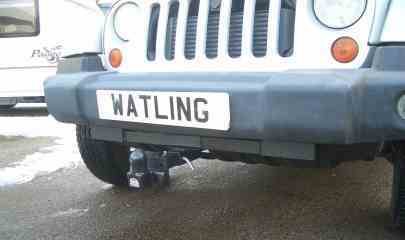 We use genuine American 2 inch box section to make the receivers on our heavy duty front towbars. This means that there are no compatibility issues with products from America. Our Heavy Duty front towbars are built strong. The material is thicker, the box sections are larger and in most cases there are more fixing points. All of which ensure that you can rely on them to do the most demanding of tasks. That being said, we still make them to be as discrete as possible and in most cases, all that is visible when the vehicle is in normal use, is the 2 inch receiver tube underneath the bumper. 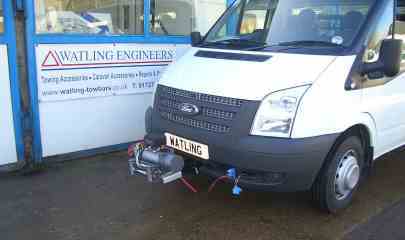 We design every heavy duty front towbar to be within the 'envelope' of the vehicle when in normal use. That means that pedestrian safety is not compromised in the event of an accident and each one comes with a rubber bung to cap the opening. 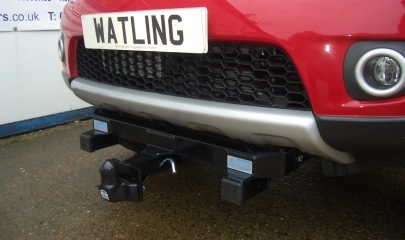 Watling heavy duty front towbars were originally designed to work with a range of Meyer Products receiver hitch snow plows and there are some examples of these here on this page. Please click the Meyer logo below for more information. Since then, they have found uses in campsites where that have been used to manoeuvre static caravans and mobile homes (weighing up to 8 tonnes! 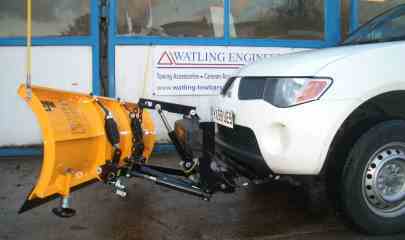 ), in boat yards where trailers are used to move and store large boats, with tree surgeons who want the convenience of a strong attachment point for a detachable winch and with many other private individuals and businesses who want a heavy duty and reliable attachment point at the front of their vehicle. Although there is no official set of rules relating to front towbars and front receiver hitches, we are submitting our heavy duty front towbars to TUV Nord to ensure that they comply with pedestrian safety rules. 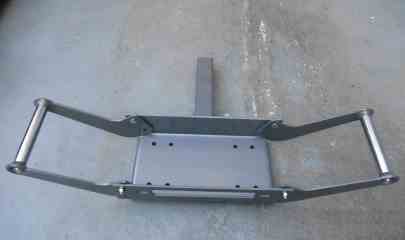 Below are some examples of our heavy duty front towbars. Clockwise from top left is a 2010 Mitsubishi L200 with snow plow, Ford Transit with a detachable winch, a Jeep Wrangler with towball mount and our removeable winch mount made specially for our heavy duty front towbars. In most cases, additional left hand and right hand receivers can be added to the standard item so as to give the user more options. You can order directly with us by calling 01727 873661.